Objective. To investigate the frequency, style and reliability of newspaper reporting of medication errors. Design. 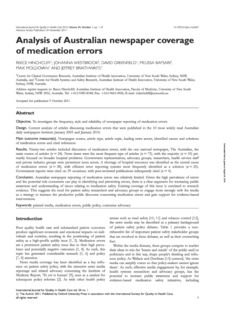 Content analysis of articles discussing medication errors that were published in the 10 most widely read Australian daily newspapers between January 2005 and January 2010. Main outcome measure(s). Newspaper source, article type, article topic, leading news actors, identified causes and solutions of medication errors and cited references. Results. Ninety-two articles included discussion of medication errors, with the one national newspaper, The Australian, the main source of articles (n ¼ 24). News items were the most frequent type of articles (n ¼ 73), with the majority (n ¼ 55) primarily focused on broader hospital problems. Government representatives, advocacy groups, researchers, health service staff and private industry groups were prominent news actors. A shortage of hospital resources was identified as the central cause of medication errors (n ¼ 38), with efficient error reporting systems most frequently identified as a solution (n ¼ 25). Government reports were cited on 39 occasions, with peer-reviewed publications infrequently cited (n ¼ 4). Conclusion. Australian newspaper reporting of medication errors was relatively limited. Given the high prevalence of errors and the potential role consumers can play in identifying and preventing errors, there is a clear argument for increasing public awareness and understanding of issues relating to medication safety. Existing coverage of this issue is unrelated to research evidence. This suggests the need for patient safety researchers and advocacy groups to engage more strongly with the media as a strategy to increase the productive public discourse concerning medication errors and gain support for evidence-based interventions.